New Delhi: Australia’s ruling Labor party voted on Sunday to lift a long-standing ban on exporting uranium to India, the first step in a long process for India to get nuclear fuel, especially if Canberra attaches stringent conditions to the exports. The Labor party move overturned a decades-old policy that excluded New Delhi from Australia’s uranium trade because it is not a signatory to the Nuclear Non-Proliferation Treaty. India conducted nuclear tests in 1974 and 1998. Australia has nearly 40% of the world’s known uranium reserves, but supplies only 19% of the world market. It has no nuclear power stations. India, the second fastest growing of the world’s major economies, is heavily dependent on fuel imports and is seeking to diversify its energy basket to power economic growth. It aims to upgrade its nuclear power generation capacity to 20,000 megawatts (MW) by 2020, from 5,000MW now. “We welcome the Labor party initiative," foreign minister S.M. Krishna said on Sunday. “Bilateral cooperation in the energy sector was an important facet of our ties with Australia." But people close to the developments sounded a note of caution. “This (the Labor party overturning the ban) is welcome but I don’t think it will be all that easy to start uranium exports to India," said a person familiar to the matter but did not want to be named. “We could be in for tough negotiations ahead for a bilateral safeguards agreement" that could entail, for example, assurances that India does not divert uranium imported from Australia for building weapons, said the person. India’s talks with Japan for a pact on civil nuclear cooperation has hit a stumbling block over Tokyo’s demand that India sign the Comprehensive Test Ban Treaty. The talks began after New Delhi signed a landmark pact with the US in 2008 that overturned a 34-year-old ban on India sourcing atomic power plants and sensitive knowhow from the international market. The caution in New Delhi seemed justified given the statements by Gillard and foreign minister Kevin Rudd earlier in the day. 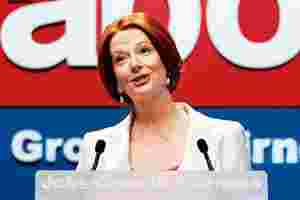 Gillard argued that it was neither rational nor intellectually defensible to sell uranium to rising powers such as China and not to India, “the world’s largest democracy" and a fast-growing nation of increasing global clout. “Let’s just face facts here— our refusal to sell uranium to India is not going to cause India to decide that it will no longer have nuclear weapons," Gillard told the Labor summit. “We can honour the treaty, we can change our platform, we can—under the most stringent of agreements—sell uranium to India if we so choose and, delegates, I believe that we should make that choice." Australian defence minister Stephen Smith, expected in India this week on a visit, backed Gillard’s proposal, saying India had voluntarily submitted to civilian nuclear checks by international regulators and was a “rising power... which is deserving of being accorded that status." Rudd, however, warned that India would need to meet “onerous" conditions before trade could begin and said it would be “a very long, detailed and, I think, tough negotiation." Former foreign secretary Lalit Mansingh was of the view that Australia could not ask for tougher conditions that it had asked of China while negotiating a bilateral pact on uranium exports. “Besides, India has negotiated a similar pact with Washington, so I don’t think this should be difficult." Describing the Labor party’s ban overturn as “an advance" in its policies vis-a-vis India, tough negotiation noted that Australia was one of the few major suppliers of uranium in the world and “nowhere is the trade as smooth as with Australia." Though India has signed pacts with Kazakhstan and Canada for uranium supplies, imports by air were expensive. Rory Medcalf, programme director, international security, at the Lowy Institute, a think tank in Sydney, said the Labor vote meant that “Australia has thrown away its sign that said it did not trust India." But he agreed that the “hard work on negotiating a safeguards agreement begins now. At a minimum, this will be the same as the agreement we have with China. This means we choose which reactors we fuel, and India must accept International Atomic Energy Agency (IAEA) safeguards and inspections in line with its IAEA agreements." “One important question now is whether the safeguards agreements are tougher than we have with China. I think we need to encourage India to stick with its arms control principles and not to test nuclear weapons again. But Australia cannot pretend that it has unique leverage to change India’s arms control behaviour alone," Medcalf said in emailed comments.